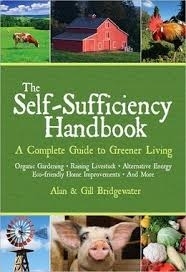 Anyone considering a shift to a greener way of living must get this inspirational and practical guide. With easy-to-read layouts and simple text, it runs the full ecological gamut, from geothermal heating to crop rotation to soap making. The Bridgewaters, well-regarded garden writers, help readers answer questions such as how much land they really require, whether or not to depend entirely on natural forms of energy, and which farm animals will best meet their needs. There’s practical information on building an insulated flue-pipe chimney, identifying edible wild plants, and composting with worms. In addition to recipes for jams, rhubarb wine, and other delicious foods, three A-Z sections offer planting and harvesting instructions for vegetables and salad crops, fruits, and herbs.